For generations, the Romeo y Julieta line has been revered for its consistently excellent, milder cigars. 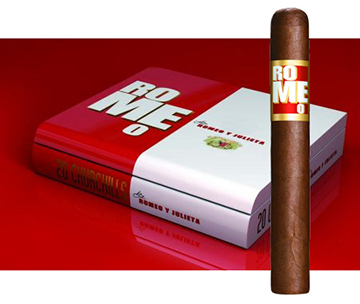 Now ROMEO by Romeo y Julieta is adding a twist to the well-known story. ROMEO is a bold and robust cigar made with the rarest and finest tobaccos carefully selected and delicately aged, then meticulously crafted by a special team of the most accomplished artisans at the famed Tabacalera de García factory. The select dark Ecuadorian Habano wrapper is handpicked for its dark, rich color and robust taste. The slightly sweet Dominican Olor binder works harmoniously with the bold wrapper, and the unique filler blend of Dominican Piloto and Olor tobaccos completes this wonderfully complex, full-bodied cigar that culminates in an unforgettable smoking experience. The ROMEO Piramides was ranked No. 3 in Cigar Aficionado's Top 25 Best Cigars of 2012 and the Toro was ranked No. 25 in Cigar Aficionado's Top 25 Best Cigars of 2013!